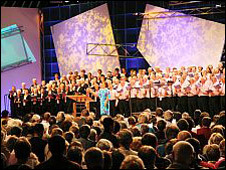 The National Eisteddfod's council has endorsed the decision to charge worshippers £9 to attend its Sunday morning service in Cardiff in August. The Union of Welsh Independent Churches said it was "disappointed" and wants all the money raised donated to Christian charities. The Eisteddfod has already agreed a portion will be donated. It cited health and safety grounds for the decision and said the charge was to enter the field not the service itself. Its board has also agreed to hold further talks with objectors. Hugh Thomas, chairman of the eisteddfod's governing board said: "The board made the decision based on our responsibility under health and safety regulations. "We're not charging to go to a religious service, we're charging to go on to the eisteddfod field. "Therefore that is why we are sticking by our policy of charging so that we have control of those who visit the National Eisteddfod site," Mr Thomas added. Dr Geraint Tudur, general secretary of the Union of Welsh Independent churches said hundreds of church members and chapel-goers in the Cardiff area would be attending because their usual places of worship had agreed not to open. "It is not right that the eisteddfod should pocket thousands of pounds profit from worshippers who leave the Maes (eisteddfod field) immediately after the service," he said. "The number of people present at the service should be counted, and a sum corresponding to their total entrance fee paid to a Christian charity, such as Christian Aid." Speaking before the council meeting in Aberystwyth on Saturday, Cytun's chief executive, Rev Aled Edwards said he wanted to see the eisteddfod reconsider its position. "It is an ageless principle, indeed one that is at the core of the Christian faith, that worship is free for all," said Rev Edwards. "Whatever reasons the eisteddfod has for this change of policy, we do not believe that any one of them is sufficient to undermine the right to attend an act of worship free of charge," he added. Elfed Roberts, chief executive of the National Eisteddfod said last month they had agreed a policy of charging everyone going to the Eisteddfod every day, including the Sunday. The admission price for adults will be £9. Management said there was a problem of people taking advantage of the free entry on Sundays. "In the past people have been going to the Maes (the eisteddfod field) at times when we weren't charging and that has led to misconduct," Mr Roberts said. "On Sunday mornings, there are hundreds coming to the Maes to come in free of charge and most of these don't go to the service."